Ay Mere Laadlo is a patriotic song originally composed by Naushad during the period of India’s war with China. The lyrics of the song is created by Khumar Barabankvi. This particular song is one of the nine songs included in the famous international album ‘The Last Journey of Mohammed Rafi’, a dedication to Mohammed Rafi by Naushad. The album is known as ‘Tere Sur Mere Geet’ in Hindi. Mohammed Rafi will be remembered for his legendary contribution to Indian music. The duo Naushad and Rafi ruled the world of Hindustani music with their symbiotic association in music. Rafi had achieved the zenith of his career due to his association with Naushad. The golden era of Indian music had acquired a great many numbers from the duo when destiny approached Rafi in the form of death. Ay Mere Laadlo can be called as a typical patriotic song. The lyrics of Ay Mere Laadlo is best suited for the theme of the song. The motivational words of the singer are so direct and explicit that they can grab the attention of even the crudest minds. It conveys the emotion of love towards one’s motherland, in this case, India. The music of the song brings a revelation about the fate of the motherland. Though the note of the song is slow and sad, it is capable of striking the hearts of the sensitive patriots like an arrow. The power of music, especially if sung by such a talented singer, is immense, and that is why the song Ay Mere Laadlo conquered thousands of patriotic minds, since the release of the album in February 1999. The classical Hindustani touch to this patriotic song can be attributed to the talent of Naushad alone. It is the simplicity of his music creation that is emerging from the complex classical notes that attracts the ordinary people. And surely, it is Rafi alone who can play the vocal role to the perfection demanded by Naushad. The harmonious association between Rafi and Naushad can be attributed to many reasons, the important being the former’s ability to impress the lay audience with the classical tone of his voice. More reasons are not required to accredit him with the crown of the perfect match for Naushad other than his command over Hindustani music and his ability to intonate and inflect, absorbing the sense of the different varieties of music. Naushad had become so dependent on Rafi that he had been chosen as the only playback singer for Naushad in those days, leaving his competitors out of the world of Naushad’s music. Music attains its purpose when it reaches the right ears. The song Ay Mere Laadlo is one of such creations of Naushad-Rafi that did not go to the deaf ears. The success of the song can be best realized by the interest shown in this song by the young generation of today. The specific theme unveiled in the song, the China War, may be irrelevant today. However, the underlying theme of the song, the call to ‘wake up and open the eyes’ to the condition of motherland has a lot of relevance in this present world. This entry was posted on Wednesday, June 13th, 2007 at 12:00 am	and is filed under Audio Songs. You can follow any responses to this entry through the RSS 2.0 feed. You can leave a response, or trackback from your own site. Check on Amazon.com at music section and Mohd.Rafi. 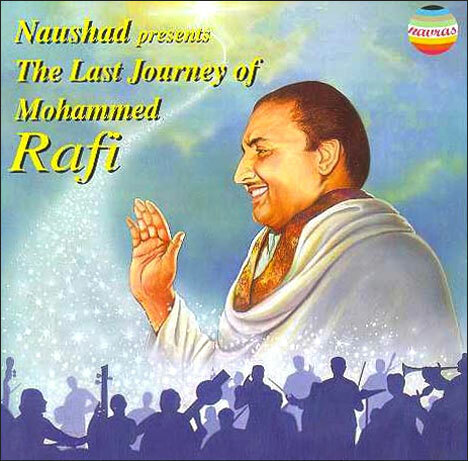 WHERE CAN I GET THIS MUSIC CD….THE LAST JOURNEY OF MOHAMMAD RAFI? It is so nice album. Can I get the video of this perticular album ? If yes, then please mail me the appropriate way to find out it. THE HIT MDS MOST SUCCESSFUL WOULD BE SJ.LP,SDB,OPN,MADANMOHAN,NAUSHAD. AND ALL OF THEM OWE THEIR SUCCESS TO RAFI N RAFI IN THE FABULOUS 50S N SWINGING 60S. ONLY EXCEPTION WOULD BE SJ\RK COMBO. “suno suno ae duniya walon bapuji ki amar kahani…” sung by rafi saab. why nobody was remembered to do this sacred job ? this proves the greatness and the essentiality of “great voices”. only singing few popular songs does not prove a singer’s greatness. we must see who is been remembered in crucial times. real rafian. i am proud to have you in between us. keep it up !!! thaks Hussein Sheikh sahab aap ne ek buhut achchi site ke bary maen bataya. Dear Rafians, please visit this site http://www.eternalrafi.com and read the facts, very very interesting on Rafi Saheb. Dear Rafians, please visit http://www.eternalrafi.com and enjoy the site. I have not heard this song, ple hussein can you send it to me? i think naushad was better than shanker jaikishan? will u give some detail about naushad failure? manner that they become trend setter and that trend was/is/will remain till film industries exist. Naushad on other hand was master of classical ragaas and used it its exteme purely but failed in the commercially popularity wise in mix raags. friends can any one tell me that by percentage of hit movies who stands at no one?naushad 70 and sj 154? who is the winner including all mds? M.Rafi sahab and Naushad sahab is the leegends of music world. Naushad is the ‘King Maker’ and others benefited from it. rafi and naushad are made for each other.i think due to naushad talent and rafi abilities both become uncompareable.